At £4k this is no impulse buy, but the money buys you superb quality. Build, good weight, contemporary neck profile and hugely classic sounds. The finish might put many off what is a stellar Stratocaster. If you’re serious about your guitars, you’ll have played a Custom Shop Fender over the years and it’ll probably have been one that strongly references the past. He’s got a point. There are plenty of new features and designs, but there’s something about an old Fender that continues to inspire us, especially when you can personalise the build to the extent currently offered by the Custom Shop. As per the base spec, of course, we have the period’s larger headstock and Schaller F logo tuners along with a gloss polyurethane finished neck (not nitro) that goes over the sides of the frets. As some of you might remember, as the 70s progressed, Fender sprayed an over-thick finish on its maple fingerboards, but this isn’t like that at all. There’s no ageing, either, although the headstock face is given a warmer tint. Grain-wise, it’s virtually bang on quarter-sawn, despite its rift-sawn spec. The quoted ’69 U neck profile here actually feels the most contemporary of the trio, the slimmer depth and additional shoulders suiting thumb behind. There are several spec details that make this model stand out, for instance the narrow spacing of the 12th fret black Micarta dots (which are 7mm diameter). And to match that big headstock, we have a bullet-style truss rod adjuster behind the nut. The wiring gives us separate tone controls for the neck and bridge pickup, but not the middle, and we get a disparate trio: Texas Special (bridge), Fat 50s (middle, RWRP), ’69 Strat (neck) - all hand-wound with the middle pickup reverse-wound with reverse polarity (RWRP), so we have humbucking mix positions on the five-way lever. Somewhere, someone has probably developed an algorithm that you could put in all the details of your Strat and Tele and it’d tell you what it’s going to sound like. In the meantime, ‘different’ is a good starting point. We are continuously amazed how no two Strats seem to sound the same, even if their specification is similar. Quite often it’s as much about the character. 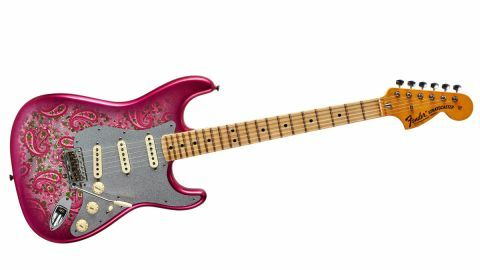 Once you get over the dress, the ’69 Strat comes across with the sort of sounds you’d put into space to tell another civilisation what Earth’s most popular electric guitar sounds like. There’s that metallic splash to the front of the note that adds a halo of sparkle to everything we hear, and in a clean environment - well, it more than does it for this writer. This’69 has funk- tastic snap, bounce and life. The tone setup allows you to tame that sparkle a little on more gained classic rock settings, but never pulls back its Stratiness. The neck isn’t remotely sticky and its shape tends towards the everyman. It might look bonkers, but it sounds sublime. At £4k this is no impulse buy and that money would bag you an exceptional guitar from many, many makers. Could you do that Friday night gig with a lesser Fender? Of course, but that’s not the point. If you can afford it, we’d wager there are few players who wouldn’t choose a guitar at this level and with the right name on the headstock. The only problem is the colossal choice. Download the 2018 Custom Guitar Design Guide and get started!